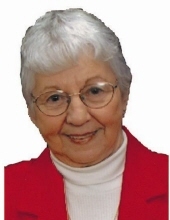 Carol Irene (Craig) LaDew 81 of Waynesville, Il. passed away Saturday, October 20, 2018 at Heritage Health in Normal, Il. Services will be 10:30 AM, Friday, October 26, 2018 at the Waynesville Methodist Church with Pastor Bill Ramsdale officiating. Inurnment will follow at Evergreen Cemetery, Waynesville, IL. Visitation will be 5 – 7 PM, Thursday, October 25, 2018 at Calvert Funeral Home, Clinton, IL. Memorials may be directed to the Waynesville Methodist Church or the Waynesville EMT. Carol was born July 1, 1937, in Minier, IL the daughter of Fred and Hazel (Pleines) Craig. Carol attended Waynesville High School and her class of 4 was the last graduating class from there in 1955. On December 22, 1956, she married Steven K. LaDew. Together, they had three children. Steve and Carol enjoyed traveling together as well as spending time with family and friends. Carol owned and operated the Waynesville Grocery in the ‘80’s. She served on the Waynesville Library Board for 30 years, was a member of the American Legion Auxiliary, Waynesville Methodist Church and a member of their Quilting Club and their soup ministry. Carol’s special interests and hobbies included raising a family and caring for God’s creation through planting flowers and gardening. Some of her favorite times were to watch her grandchildren and great-grandchildren engage in sporting events and activities. Survivors include her beloved husband of 61 years, Steve; children, Craig (Joni) LaDew of Danvers, Scott LaDew of Waynesville and Terri (Bill) Culhan of Boca Raton, FL; 6 grandchildren: Karli (Doug) Yoder, Shane (LeAnne) LaDew, Toni LaDew, Jessie LaDew, Cassi Culhan and Jenna Culhan, 3 great-grandchildren, Cade and Emery Yoder and Gage LaDew; 3 step-great-grandchildren, Cameron, Pierce and Braden. She is also survived by brothers Wayne (Judy) and Kenny, special sisters-in-law, Margie Craig, RoseAnne Craig, Judy Craig and Jan Bryan, special family friend Cindy White as well as many nieces and nephews. She is preceded in death by her parents and two brothers, Russell Craig and Alan Craig. Carol was an amazing wife, mother, mother-in-law, grandmother, great-grandmother, aunt, sister, sister-in-law and friend. Her generous heart and bright smile will be missed by many.